Hi everybody! Today I have a nice combo to share with you. Zoya Vega is a Magical Pixie Dust. The official description from Zoya is, “Vega by Zoya can be best described as a blue opal sparkle, textured PixieDust with Mega Hex Iridescent Particles”. This is a PixieDust on steroids. It has a pretty light blue base loaded with holographic glitter in a few sizes and holographic “pixie particles” too. It is a textured polish so will dry down to a very gritty texture. A couple coats of a thick topcoat can smooth it out though. Formula was great. No dabbing required to get the glitter placed on the nail. I used 3 coats for the pictures (2 would have sufficed, but I smudged a nail so just added another coat). Some are not topcoated and some will have topcoat, as noted before the pictures. 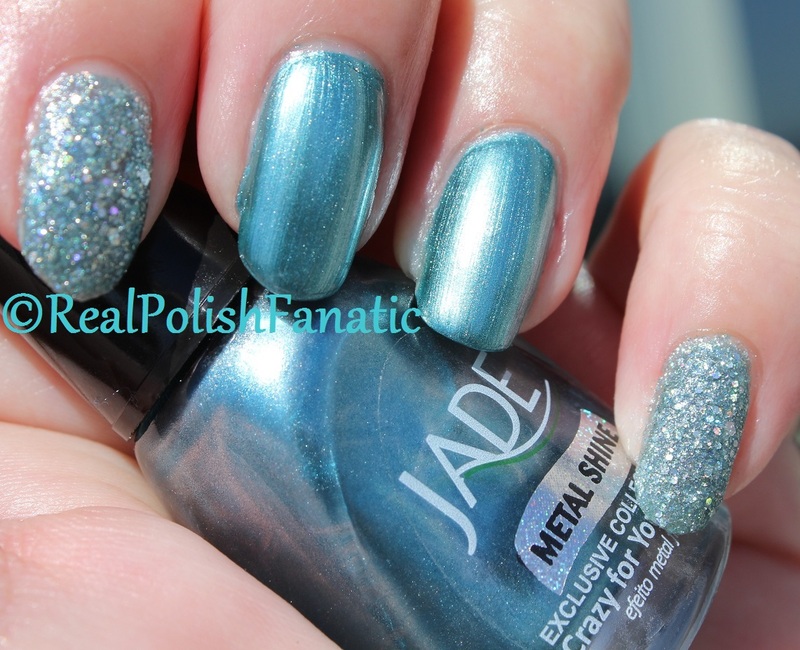 Jade “Metal Shine” Crazy For You is a gorgeous slate blue chrome finish. The chrome finish equals lots of brushstrokes. You can cover this up by sponging on the last coat. I will show you photos of it both ways. I use a triangular makeup sponge for this, and you can just cut off the part you have paint on and reuse the sponge multiple times. I bought this polish in a special edition 11 piece set called “The Unique Collection”. Formula was good for a chrome. 1 coat gave great coverage. I used 2 coats without topcoat for some of the photos, then I sponged on a 3rd coat and added topcoat. I will notate which is which above the photos for you (although it’s pretty obvious!). Zoya Vega 3 coats without topcoat and Jade Crazy For You 2 coats without topcoat. Next I topcoated Vega and sponged on a 3rd coat of Crazy For You and topcoated that. The brushstrokes where not as bad looking in real life as in my pictures, but sponging on that third coat made a world of difference! It really changed how the light hit it.